How does The Amalgam Collector™ work? Where does the separator go? How often do you need to replace it? What do you do with the separator when it is full? Is the Amalgam Collector certified? What is the weekly maintenance? Do you need special filters or chemicals? Do I have to sign a contract for the units? fill line has been reached? Do you lose pressure in the units? Can the unit be bypassed if necessary? What are the conditions of your warranty? 1. How does The Amalgam Collector™ work? The unit acts as a collection tank allowing settling and decantation, thus separating liquids from solids. See also: General Operation. 2. Why should it be used? The Amalgam Collector is designed to help eliminate the release of (even the fine sludge of) heavy metals into the environment via the sewer system. 3. How efficient is it? Following recommended settling times and decantation procedures allows for greater than 99.9% reduction of heavy metal pass through. 4. Where does the unit go? There is one design for use at or near chairside and a second design for use near the vacuum system generator (pump or turbine). 5. How do you operate it? You allow The Amalgam Collector™ to fill during clinic operating hours. After the contents of the unit have settled while the vacuum system is off (for at least 12 hours) the valves are set prior to restarting the vacuum system. This allows the top liquid to be drawn off. (It takes about 15 seconds). Then the valves are reset to collect the new day's material. See also: further operating details. 6. How often do you need to replace it? The average office (4 chairs) will "fill" a unit in approximately 18 to 24 months. 7. What do you do with it when it is "full"? The unit is easily emptied into a separate container and then reinstalled for continued use. It can also be removed, capped and replaced at an additional cost. The collected sludge is either shipped directly to a recycler or collected by an appropriate hauler who will ship it to a recycler. 8. How do you install it? The Amalgam Collector™ is sold in kit form. Instructions for installation are included. The order must specify certain information about the office tubing and/or plumbing of the vacuum system. The price for a single unit starts at $625.00 (USD). Discounts for ordering multiple units are available. See also: further pricing details. 10. Is The Amalgam Collector™ certified? In recent testing by the American Dental Association the units surpassed the ISO standard of 95% efficiency with a rating of 99.9%. All units are ISO-11143 certified. 11. What is the weekly maintenance? The maintenance is done on a periodic basis to decant off the liquid in your canister that will build up faster than the sediment (amalgam sludge). The units are clear so you can observe the amount of liquid and determine when the decantation is necessary. Most offices decant the liquid once per week, usually on a Monday, and incorporate it into the other assistant's duties to start the morning, i.e. turning on the compressor and vacuum system. We will be happy to refer you to one of the many offices that use our units so you can talk with the personnel there about this easy maintenance. This maintenance involves turning one or two external valves. 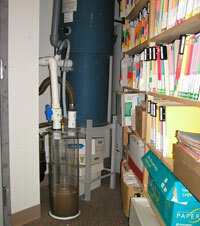 The unit is never opened until the sludge has reached the maximum sediment level (typically 2 to 5 years!). When the unit's external valves are turned, the vacuum will draw off the liquid down to the bottom of the liquid out tube. This maintenance takes less than 1 minute. This maintenance is so simple that we would be foolish to sell a contract! You observe the liquid level and you determine when to decant the liquid. Again, we suggest developing a routine for this. 12. Do you need special filters or chemicals? Our units do not have filters. They are sedimentation systems and, interesting enough, are simple but still rated as the #1 unit in removal efficiency as per the JADA research. All of the various research studies to date on amalgam separator units demonstrate the superior efficiency of a sedimentation system. We do suggest you put 1 cup of your favorite cold sterilant weekly through your system. This liquid will end up in your collection canister. You do not need to purchase special chemicals. 13. Do I have to sign a contract for the units? No, you buy the unit, you do not rent it. Our prices run from $625 to $1295 (US) for our most popular sized units. We can accommodate offices from 1 to 12 operatories with our units. Units may be put in series to accommodate even larger offices. 14. What do I do with the sludge when the maximum fill line has been reached? The company that presently takes your "dry amalgam", will probably also take your amalgam sludge. We have a commitment from two companies to supply "buckets" for the sludge, the transportation, and proper disposal for approx. $150. I have included a list of "mail away" programs in this packet of information. Remember that you will not typically need this service for 3 to 5 years. You can empty the canister yourself into a "bucket" and store the sludge on site until you have enough to have it hauled away. Note that this is the only time the unit is opened. 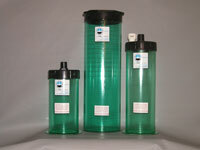 Another option is to purchase our "change-out set" which includes a new canister and a lid with no openings. Prices on change-out sets start at $350. Remember, however, that there is nothing wrong with continuing to use your original canister once it has been emptied. 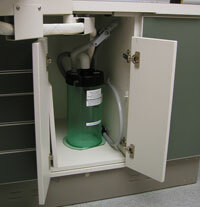 If you use the change-out set, you can store your used canister on site or hand this to your hazardous waste hauler. We have agreements with nationwide companies who deal in proper disposal of amalgam sludge. If the hauling gets to be a problem for you, please give us a call. We do not sell a contract for the sludge removal since the time needed for this service will vary greatly from office to office. You can buy your "bucket" or "change-out set" at any time. You will need no special wiring or plumbing for our units. The unit is simply "patched" into your suction line at any convenient place between the patient and the central vacuum system. Our units work with either dry or wet vacuum systems. They do not need special height placement either. Most centrally installed units sit on the floor just prior to the vacuum. Some of you will be pleased to know that our units are sold in kit form so that you can actually install them yourself. Doctors who have installed the units themselves are surprised at the ease of installation. We find that our installations take less than one hour. We can arrange for a technician in your area to do the installation if you like. Our typical cost for installation runs approx. $150 (US). The space needed to accommodate our most popular units is a "base" area 8" x 8". 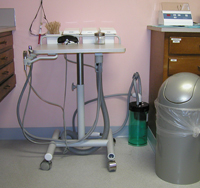 The single operatory unit needs a space 15" high and the central unit requires a space 24" high. Maximum liquid capacity of the canisters is 1 and 1/3 gallons for the CH12, 2 gallons for CE18, and 4 and ½ gallons for the CE24. You need to purchase a unit with a canister large enough for at least one day’s collection of liquid. 16. Do you lose pressure with our units? You do not lose pressure with the use of our unit. This is due, in large part, to the fact that we have no filters to clog. When one of our technicians installs a unit, he/she checks your vacuum system before and after the installation and records the pressure measurement on our warranty to show that you do not lose pressure. 17. Can the unit be bypassed if necessary? If for any reason it is desirable to bypass The Amalgam Collector™ once is has been installed, only a few simple steps need be taken. The steps below are an example for a centrally located unit. Modified steps for a chairside unit are available. Step 1. Disconnect the outgoing air assembly by removing the 1" x 3" connector from the adaptor attached to the vacuum pump filter (elevate the tubing to prevent residual liquid from flowing out the (now) free end). Step. 2. Disconnect the incoming materials assembly at the ell attached to the lid leaving the ell behind. Step 3. Place the 1" x 3" connector just removed from the ell into the adaptor attached to the vacuum pump filter. 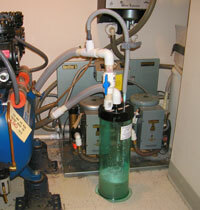 This can all be done with the vacuum system in operation since step 1 stops the flow of materials from the operatories. To reinstate the usage of The Amalgam Collector™ just reverse the steps outlined above. 18. What are the conditions on your warranty? We are also members of the dental community and want to have only satisfied "customers." Any sale is a "no risk" purchase. If for any reason, the unit does not seem to be the correct one for your office, we will take the unit back and refund your money. The actual warranty covers the unit for defects for 30 months from the date of purchase. The only restrictions on the warranty are for temperature (placement area or liquids going into the canister cannot be over 109 degrees F) and vacuum pressure (limited to under 15" of mercury). The vast majority of offices operate well under these two limiting conditions. Please call 800-816-4995 or 206-525-4995. Ask for Ross or Deanna. We can also be contacted by e-mail.